You probably know someone with lactose intolerance. Maybe that person is a family member, a friend, or you. It’s most common among Asian Americans, African Americans, individuals of Jewish descent, Mexican-Americans, and Native Americans. That being said, any person could have lactose intolerance. Do not try to diagnose yourself. If you think you might be lactose intolerant, it’s important for you to see your health care provider. 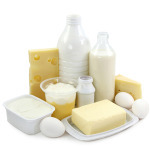 The same discomfort caused by lactose intolerance could also be caused by other health conditions. Your health care provider is the only person who can confirm that you are lactose intolerant. Once your health care provider figures out what is causing your digestive discomfort, you can work with them or a dietitian to try to manage your symptoms.